Denon unveils new premium X-series AV receivers | What Hi-Fi? 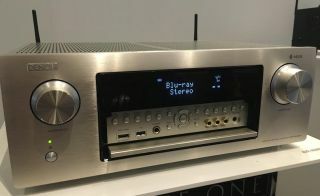 The AVR-X4300H (£1199) and AVR-X6300H (£1899) are Denon’s first home cinema amplifiers to feature built-in support for the company’s HEOS range of wireless multi-room speakers. We’ve already reported on the new entry-level models from Denon’s fourth generation of X Series home cinema amps. In fact, we’ve already awarded the AVR-X2300W a five-star review, so we’re obviously excited to see the company has just added a couple of premium models higher up the range. Needless to say the proverbial kitchen sink has been thrown at the AVR-X6300H (pictured above) and its sibling, the AVR-X4300H (pictured below), when it comes to design, features and connectivity. Both amps have been fitted with high-grade audio components throughout to aid sound quality. There’s 2.4GHz and 5GHz wi-fi, Audyssey set-up software, eight HDMI inputs compatible with 4K video running at 60Hz, and three HDMI outputs for sending video to different zones and displays. There’s also DTS:X and Dolby Atmos support out of the box, with support for Auro 3D to come via a firmware update at a later date. For the first time on any Denon AV receiver, both of these premium models have support for Denon’s HEOS HS2 Series family of multi-room wireless speakers buit-in, so they can slip into any potential Denon-based multi-room solution. Both amps are set up for streaming, with support for Tidal, Deezer, Napster, Soundcloud, Spotify Conect, Bluetooth and Apple AirPlay all squeezed in. The internal DAC supports hi-res audio streams up to 32-bit/192kHz. Denon will also be offering a new Audyssey smartphone app (for Android and iOS) if you want to delve deep into your receiver’s set-up. It isn’t a freebie though, and will cost around €20 from the relevant app stores when it arrives in October. The main difference between the AVR-X4300H and the AVR-X6300H is that the former is a nine-channel amp running at a claimed 200W per channel, while the latter ups the ante to 11 channels and 205W per channel. Both models are due to hit shops in October 2016.